Fig. 93. 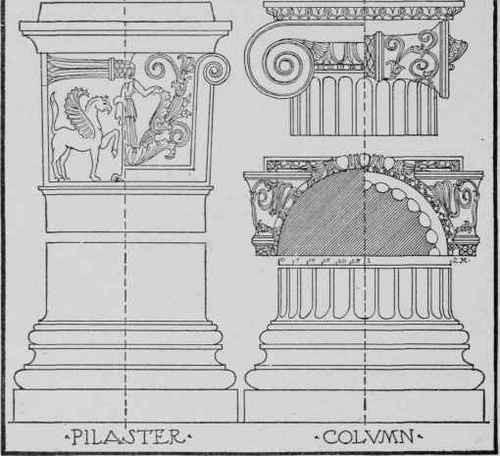 Comparative Column and Pilaster Treatment. These pilasters are sometimes given a base the same as the columns, but their cap and base are more customarily formed by the mouldings which are placed at the base and top of the wall against which these antae are placed. 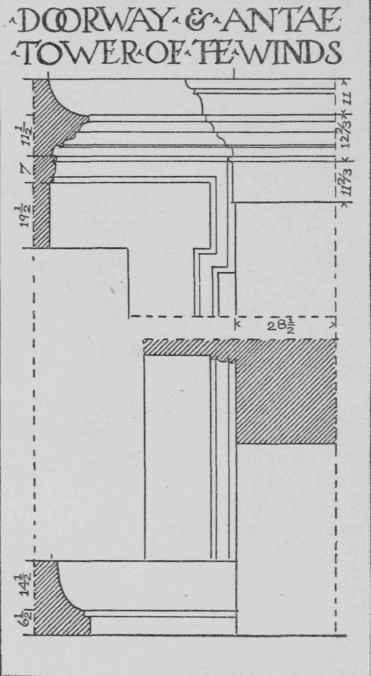 In the Doric Order they generally have a plain projecting plinth base, with no mouldings, although sometimes the shaft descends directly to the stylobate or platform, as in the column of the same Order. Ionic Pilasters. With the Ionic column the Greeks employed many different types of pilaster capitals, some being very elaborate in their form and ornamentation. The Ionic antae, the same as the Doric antae, have for their bases the lines of the base of the walls; and for the crowning mouldings of their capitals, the mouldings are covered with ornaments, eggs-and-darts, beads and reels, honeysuckles, etc. The capital of the Ionic antae receives from the school of Pythius sculptured decorations of great variety. The best type is undoubtedly that which we find used in the Erechtheum, with the various examples, of the Ionic ornamented capital and column which we have already illustrated. Two of these pilasters are shown in Fig. 92. These antae capitals are moulded and carved quite elaborately, while along the surface of the frieze in each instance runs the same treatment as is used to adorn the neck of the accompanying capital. These pilasters are given a moulded base, much the same as that employed on the columns, although the members are ornamented with more horizontal lines than are used on the column base. It will be observed that these pilasters follow the same general treatment as those used with the Greek Doric Order; and they should be compared, in all the examples illustrated, with the columns, shown elsewhere, with which they were used. Fig. 93 shows side by side a comparative column and pilaster treatment from the Temple of Minerva at Priene. This illustrates the size of the pilaster as regards the column diameter at the neck and base. As will be seen, it approximates a mean between these two dimensions. The capital of the pilaster is shown one-half on each side of the center line, to indicate the treatment both of the end and of the face. The same treatment was applied to the square detached columns or piers employed in this temple. In Fig. 94 are shown the end and face of a pilaster cap from the Temple of Apollo at Miletus. These pilasters, each ornamented differently, were used attached to a wall surface, and were connected with each other by a carved and ornamented frieze. The end of the pilaster, therefore, is shallow in width and depth, and only the face is regarded in reference to the column width. Corinthian Pilasters. Of the use of pilasters with the Greek Corinthian Order, we have only one authoritative instance-that of the Tower of the Winds at Athens. There is no pilaster used with the Corinthian Order on either of the other examples, the Monument of Lysicrates or the Tholos at Epidauros; and in this example from the Tower of the Winds, illustrated in Fig. 95, the pilaster was used only on each side of the entrance doorway to receive the entablature returning from the small pedimented porch, which is more fully shown in the illustration of this building in Fig. 74.